Nebenschauplätze. Ränder und Übergänge in Geschichte und Kultur des Aufklärungsjahrhunderts / Scènes secondaires. 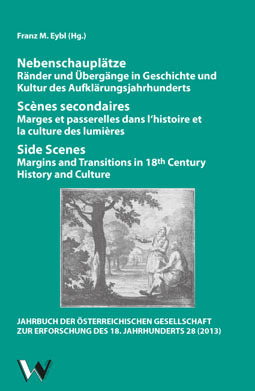 Marges et passerelles dans l'histoire et la culture des lumières / Side Scenes. Margins and Transitions in 18th Century History and Culture. Movements within the Age of Enlightenment were diverse and the new changes appear in the most distinct fields of action and cultural sectors. This yearbook focuses on the epoch-making historical process on the side scenes. The contributions lay emphasis on social and cultural margins and transitions. In doing so, they give weight to the reception of international impulses of change. Besides, they describe and evaluate the difficult realization of the epoch's goals and to a lesser extent on its reformulation. Reformations have to oppose an equilibrium, social tensions either result in riots or are defused with the means of regulatory actions, regional cultural systems contravene with new methods and norms. This rather wide range of topics is closely connected with the questions of cultural transfer and structural reorganization, which were discussed in earlier yearbooks. The interdisciplinary position of the present volume sheds a new light on the Habsburg Monarchy during the Age of Enlightenment, focussing on history as well as on culture and art. Literaturbericht. Aktuelle Forschungen zur "Aufklärung"